Great info Jean. I never thought of doing alteration 2 but it makes so much sense!! I love your dress post alterations. Your DIY posts are always so informative and helpful. I wore my dress today. The sleeves did not bother me too much but I will try to do alteration # 2 this weekend. Thanks for sharing, Jean! 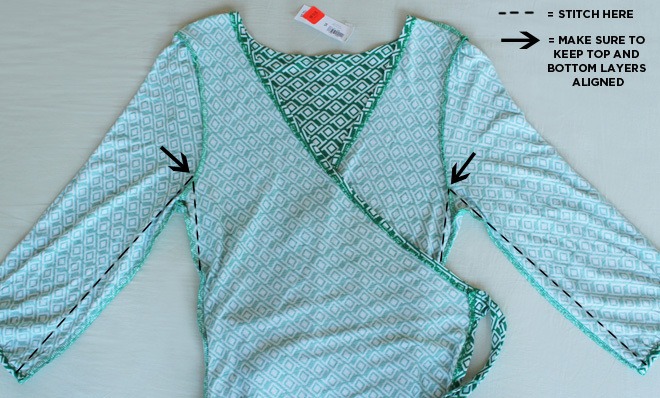 Just wanted to add one tip to alteration #3 – when reattaching the sleeve, make sure to start at the armpit. If there is a slight misalignment of size, a little bubbling here will not be noticeable. The alterations look fantastic! I would have just sighed and put it back on the rack! Wow, interesting. 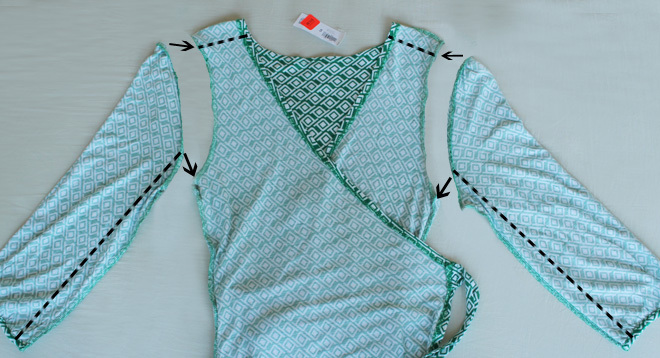 I need to learn to sew, but this was the clearest tutorial I've ever seen. Really great job Jean!!! Gah why can't that dress be available in Canada?!?! WOW! You are amazing Jean! Love your blog as always! Jean your tutorials are always so informative and useful so thank you for posting them! i love your blog! i can really relate being slightly less than five ft and having to get everything tailored to fit! im def following your blog! This is a very clear and easily understandable tutorial, Jean. Thank you! I also want to mention the impressive level of grace you've shown in addressing the negative comments on your site. You are a class act and we could all use a lesson from you! Awesome post, Jean. I love the dress post alternation. Your DIY is very helpful and informative. I want to alter my dress but I am afraid too. You are so good at sewing! I could never do something like that without messing up the garment. Mad props. This is really helpful! I do small alterations on my own, like bringing up the neckline but not stuff like this. You're so skilled! Thanks for sharing. ahahaha – I was ready your Alteration #2 and I'll admit I did cringe a little. But after seeing #3, you KNOW how to properly do the alteration, and seeing your AFTER in #2, I'll admit, I can't really tell. You're quite the seamstress and designer Jean! Thank you for taking the time to post something that's very helpful and easy to understand. It is very much appreciated! Thank you for this post! Very clear instructions and seems like a simple way to take care of such common fit issues. Thank you so much for these new posts showing us how to alter clothes ourselves. I learned a lot from you by looking at these photos because it made what you were explaining easier to understand and follow. P.S. This dress looks polished and lovely on you particularly after you altered it. OMG!! you're so good at altering your clothes. you should teach me the basics of altering clothes. I tried alter my dress once, it ended up like crazy. I read your other blog about this dress and loved it so much I went out and bought the dress for myself (along with other pretty dresses that were also on clearance). I wasn't able to score the dress for $10.99, at my Old Navy it was on sale for $12.49 (but then they did have 10% Tuesday when I bought it so I guess it came out to about that price). This was so informative thank you! I wish I could sew. I do have one question: The sleeves and armholes on my dress fit perfectly but the neckline is too low for me, would you have any suggestions on how I can readjust it? I was thinking of just wearing a white bandeau but it might ruin the look of the dress. Would love your input. Amazing tips! Thank you for sharing! I love how your DIYs and tutorials are always so clear with just enough detail. You're a great teacher! I love this! I have always wanted to learn to sew and am saving up for a machine and lessons. But I love how you have given tips for us hand-sewers too. Thanks for showing the fit issues. 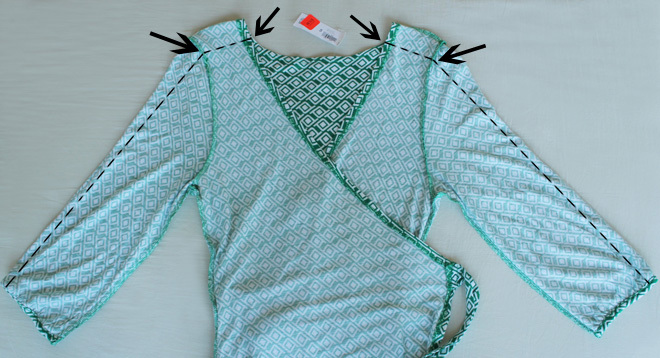 I always have dresses that just don't seem right… and I figured it was the length but now I see that it's also the arm holes and the waist (now THAT is why so many dresses are so low cut on me and I have to wear camis). Keep up the great work. And ignore the haters… sheesh, some people are just such weirdos. Try to focus on the tons of followers you have that love your blog and rely on you. Even though I'm about 10 years older than you, whenever I follow your dress advice I get tons of compliments. Thanks for posting, even with your busy work and study schedule! This is super helpful! I'm always too chicken to cut up my own clothes. Do you have a sewing machine? This is very helpful Jean! 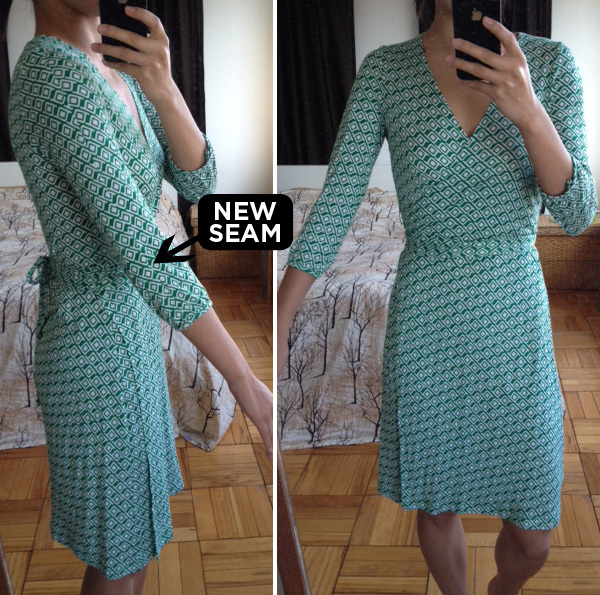 I stopped by an ON and picked up this dress in both colors (the only ones left in xs too!). I will have to try either #2 or #3…might have to get my mom to help me actually lol. You are a genius!!! 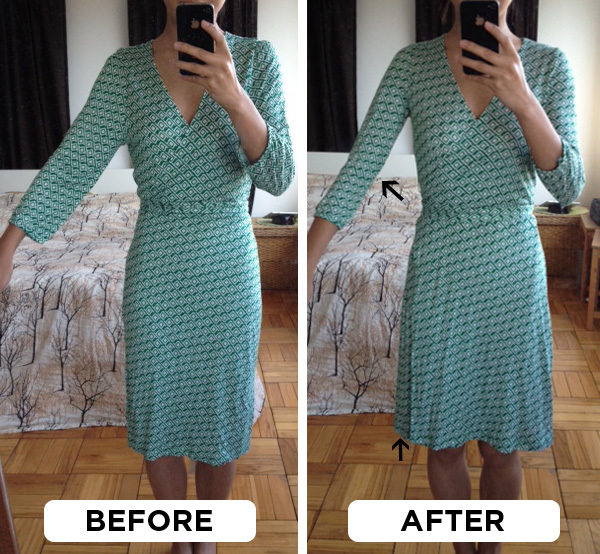 And did you rip apart that dress just for the last picture and then resew it using alteration #2? WHAT A BLOGGER!!!!!! Great post! One thing to keep in mind about negative comments is that they usually become more plentiful the more overt success you achieve. ( I used to compete in pageants and didn't get any negative comments/ feedback until I actually won a major statewide pageant). You handle them well, but understand that they "come with the territory" of increased success and visibility of your blog. Thank you so much for this clear and approachable tutorial. And for taking the time to show three different ways to do it. There are so many shirts and ddresses that I have been meaning to take to the tailor…you have inspired me to learn to do it myself! That having been said…years ago I bought a sewing machine (on super-sale) but have always been so scared to use it. I took a beginner's sewing class at the BCAE and it was useless. So, I was going to sell the machine…but now I think I may keep it! Any tips for people like me and Anonymous above who are scared of them? I need to take sewing lessons and invest in a good sewing machine. How much would a good basic sewing machine cost? Holy cow, those sleeves were huge. I'm so annoyed with Old Navy screwing with sizing just to accommodate the ridiculously huge and growing waistlines in this country. you're awesome Jean. Thanks for the informative tutorial. I've always wondered whether if its really that simple and it is! Thanks for posting step by step instructions on how to alter a dress. I bought a sewing machine a year ago, and have yet to use it. I also don't really sew all that much. But this helps a lot! Thank you for this post, it is so useful ! I also have the problems of too long length and too low waist and neckline, so usually I don't buy any dresses, even if I like them (but I buy skirts ;-). And I find it a pity because some dresses are so feminine ! But now that you have shown how to do, I will change my mind, many thanks !!! Not affiliated (I just rang up the owner, who was very sweet, but I don't know her at all and cannot vouch for the classes…yet!) But she also teaches how to do hems and simple alterations and has more advanced classes too. Affordable for the area. A few years ago I took BCAE classes and they were rubbish – they have since changed the teacher but I am reluctant to pay $200 to get disappointed again…. jean, you are such a diligent worker bee. the alteration you did makes the dress look even better. can i send mine over for you to do? hahaha!! if it was me, i'd probably go for #1, but low neckline would be an issue. appreciate all the choices. You have explained it so well! The dress looks lovely on you and cant wait to see you style it! Tried out this dress today thanks to you. Neck line its so deep. Wish I had your talent for diy. Too scared tob attempt it. Maybe next time.